Every time we celebrate at home, we'd make dumplings. When I was young, my parents would always make chive and shrimp dumplings every Sunday, so much so that I got really sick of dumplings. (I would always ask for McDonald's instead). 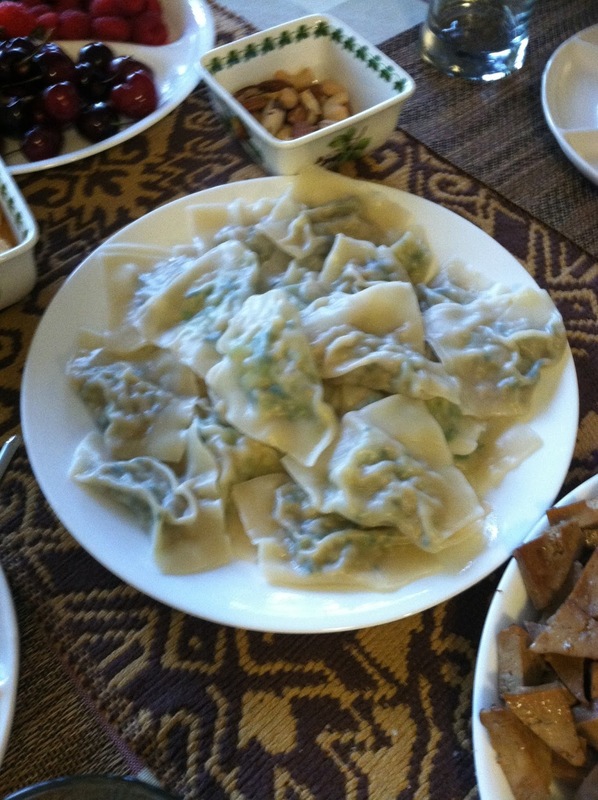 My parents would tell me that dumplings were like a luxury food back when they were little, because meat was really rationed so it was usually eaten during major holidays like the Lunar Festival. 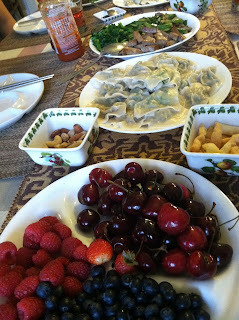 When I went back to Canada to visit my parents, they of course, made dumplings. 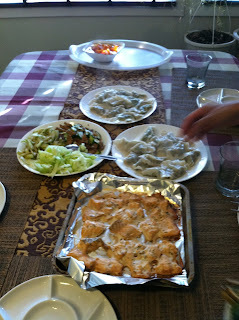 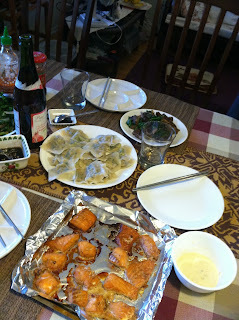 Especially because my cousin and her bf were coming, it would be a family feast of dumplings. 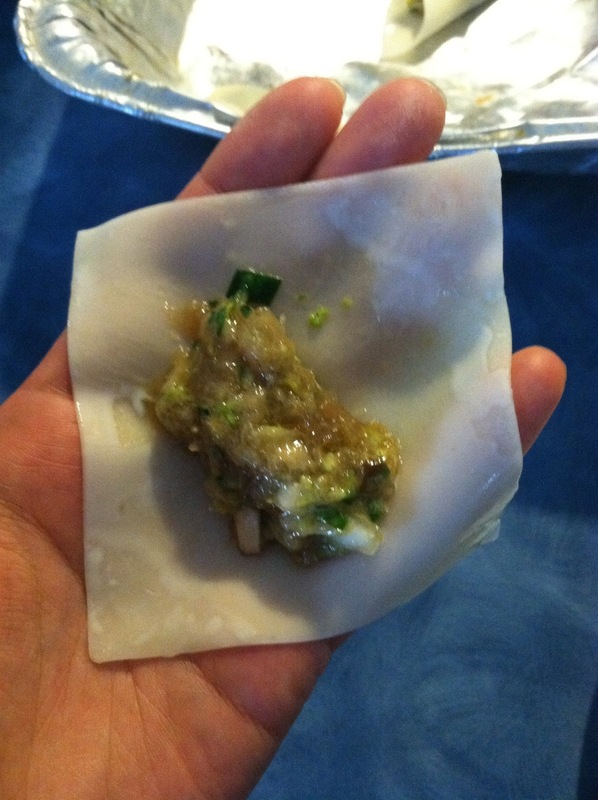 We used to make the dumpling dough by hand, but now we buy wonton covers from the local grocery store. Wonton covers because it can hold more filling than dumping covers, which are usually round. And usually we'd get 4 packs of them. Perhaps the hardest thing about dumplings is the filling. We grow our own chives in our backyard, and cut them fresh to make the filling. 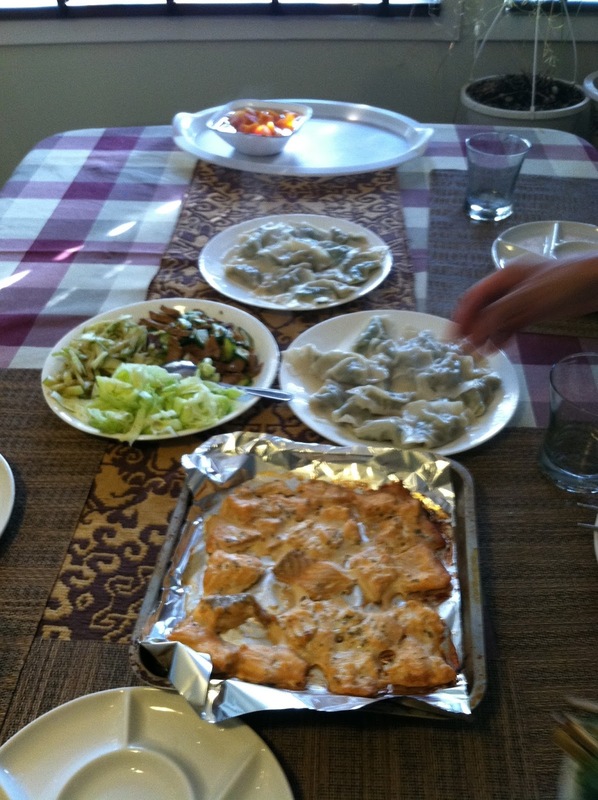 My parents aren't really big on beef (cuz of Mad Cow disease I think) so we usually use chicken or shrimp as the meat fillings. 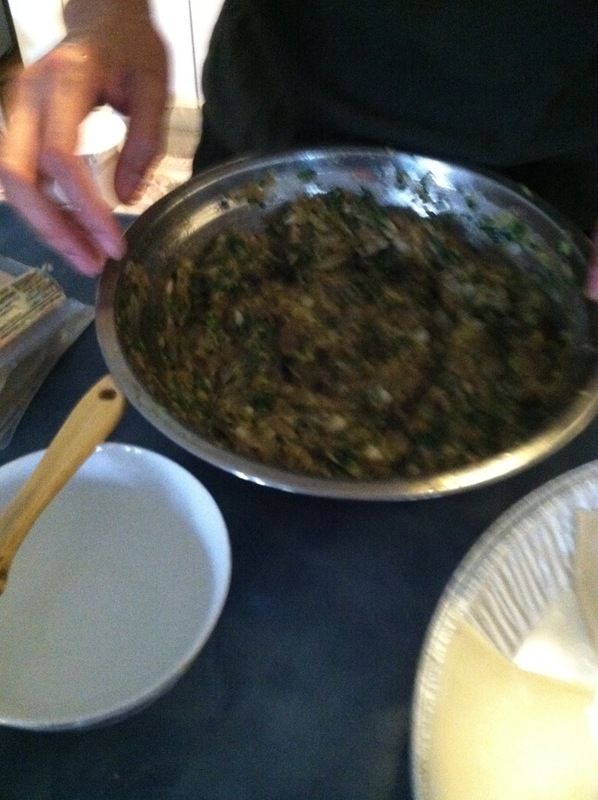 We pop the meat and the chives (separately) into the food processor and pulse it until you can't see the individual bits. 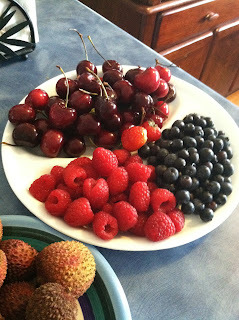 Then combine them together and season. 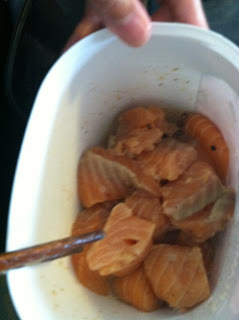 I think the seasoning is a technique because you have to guestimate how much salt/pepper/soy sauce without tasting the raw meat. 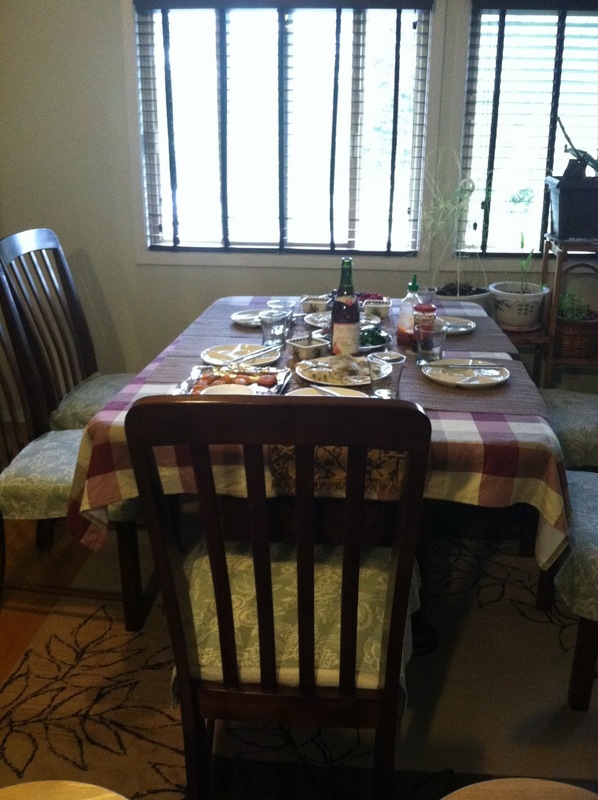 That's why it's a job fit for my highly analytical Dad. 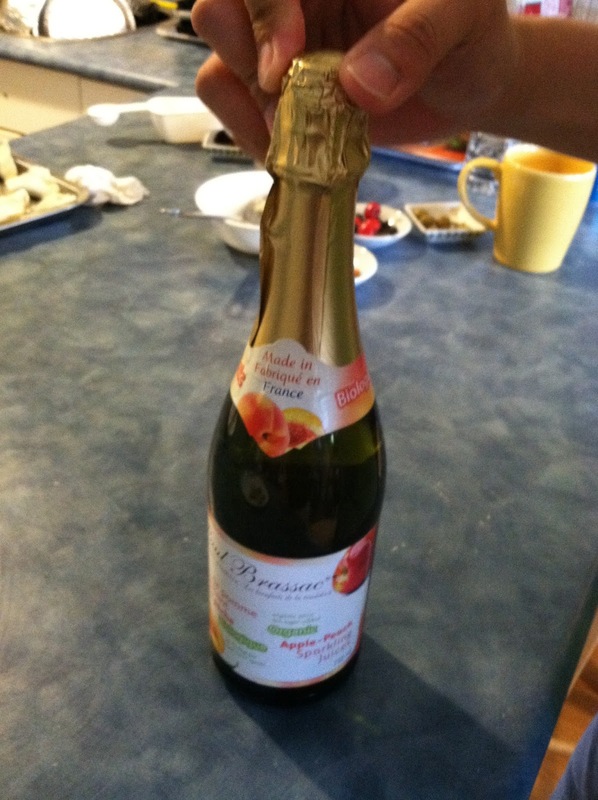 Now let's get down to business. 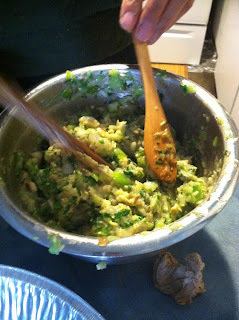 First you take a little brush and trace the edges of the dumping/wanton cover with water. 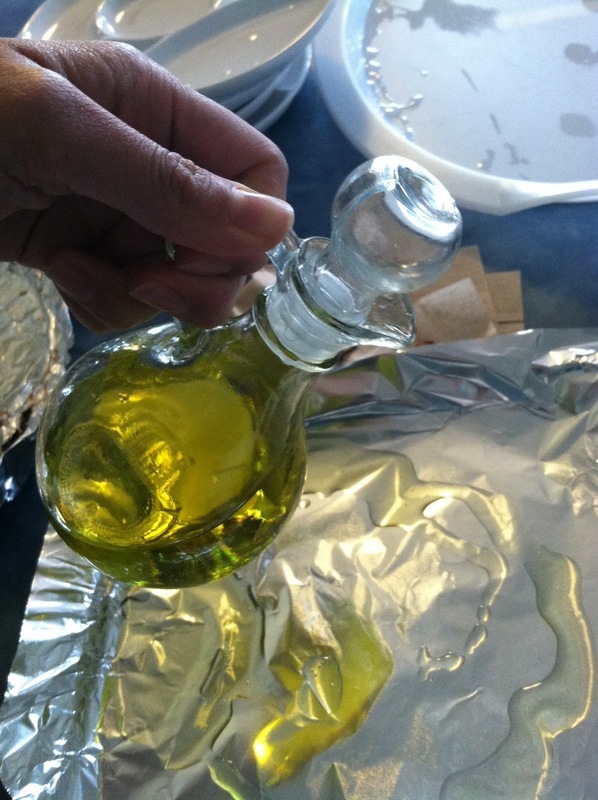 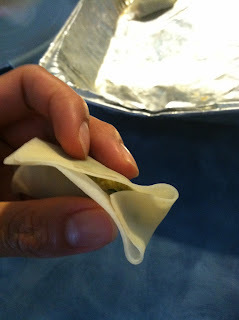 This makes the cover sticky enough to be stuck together during the filling and cooking process. Scoop up a generous chunk of filling and drop it in the middle of the wanton cover. 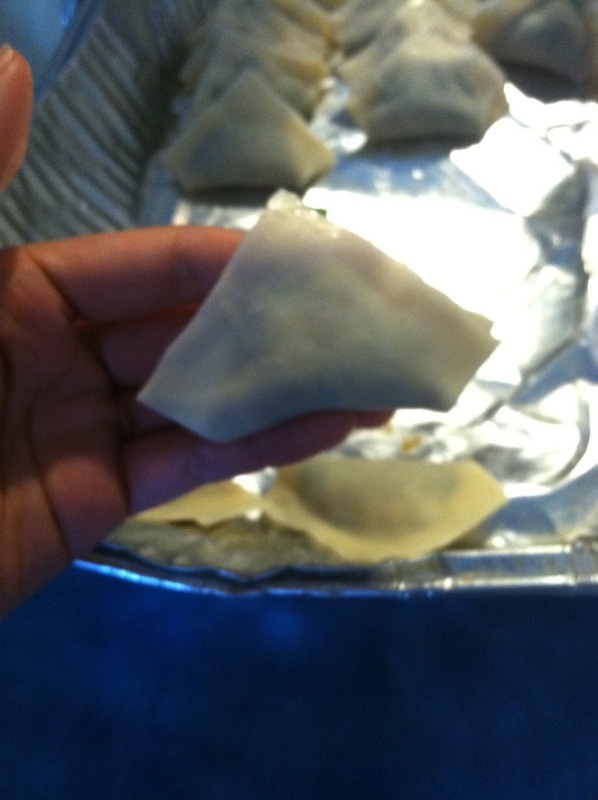 Then fold over diagonally, forming a triangle. 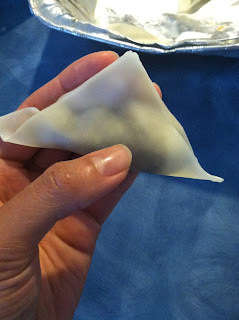 Fold in one edge of the dumpling cover into a mini triangle at the side, then press the sides together. 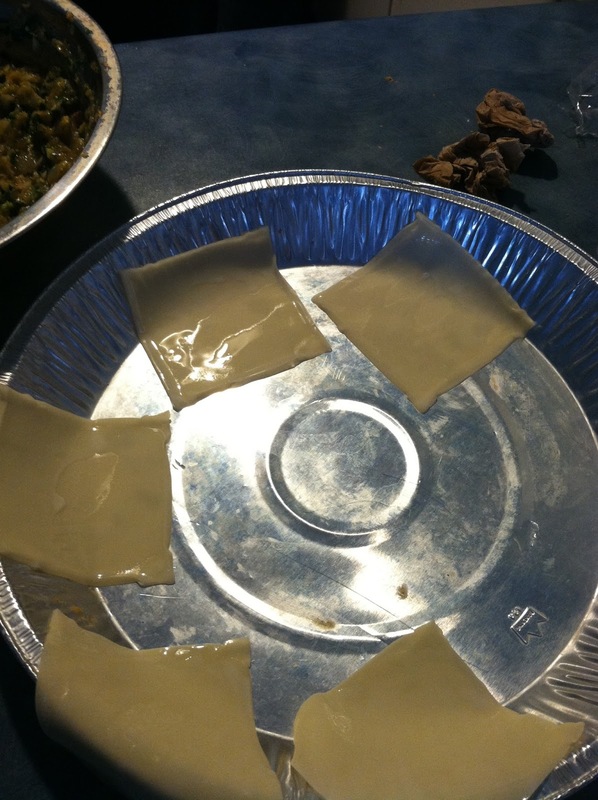 If the edges come loose, reinforce with more water. 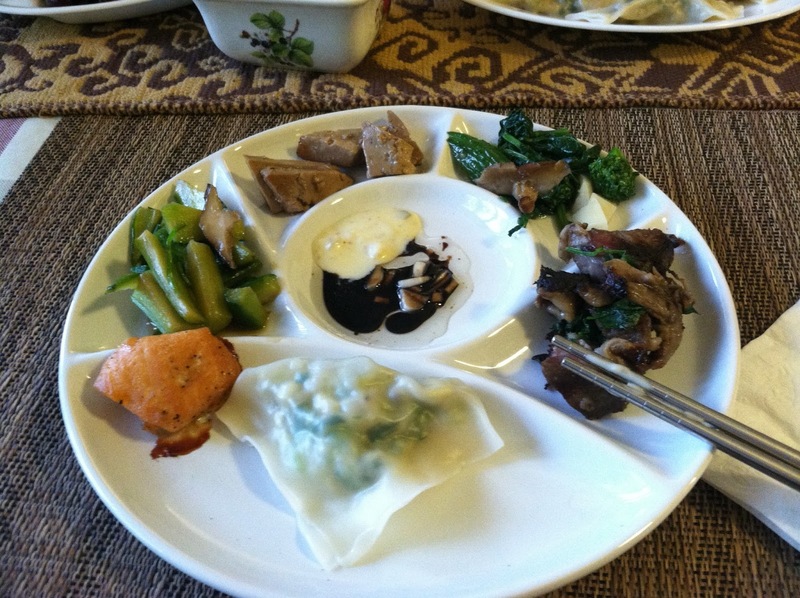 We usually cook up a storm of side dishes alongside our dumplings. 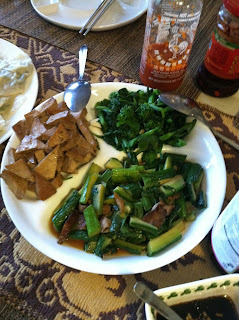 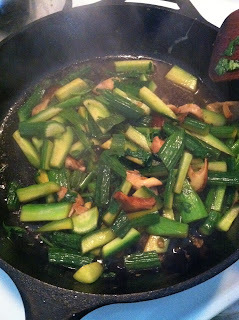 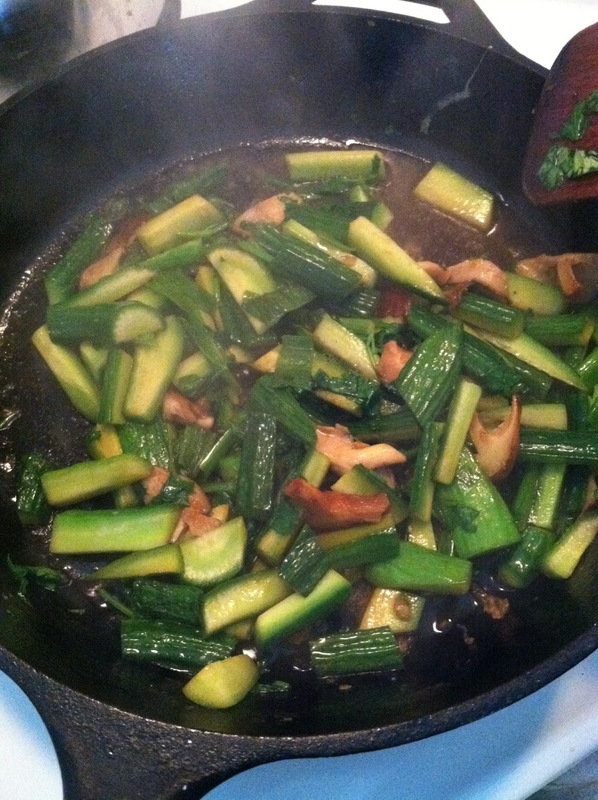 We like to eat a lot of veggies like stir-fried cucumber with mushrooms and green onions. That day, we also grilled up some salmon (altantic salmon and grapeseed oil both curtesy of Costco). I was in charge of the salmon. 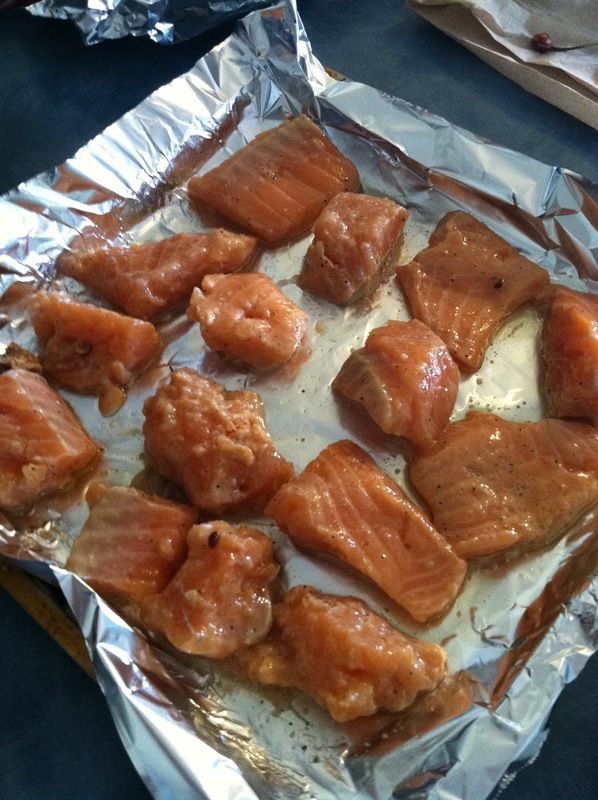 First we marinated it in salt/pepper/olive oil for 30 minutes, then laid it flat on a greased foil to send off to the oven at 375F for 45 minutes. 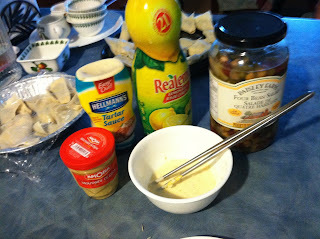 Meanwhile, I stirred up a tartar sauce using tartar sauce, lemon juice, some juice from our four bean blend (a combo of sweet and sour), and a dollop of french mustard. 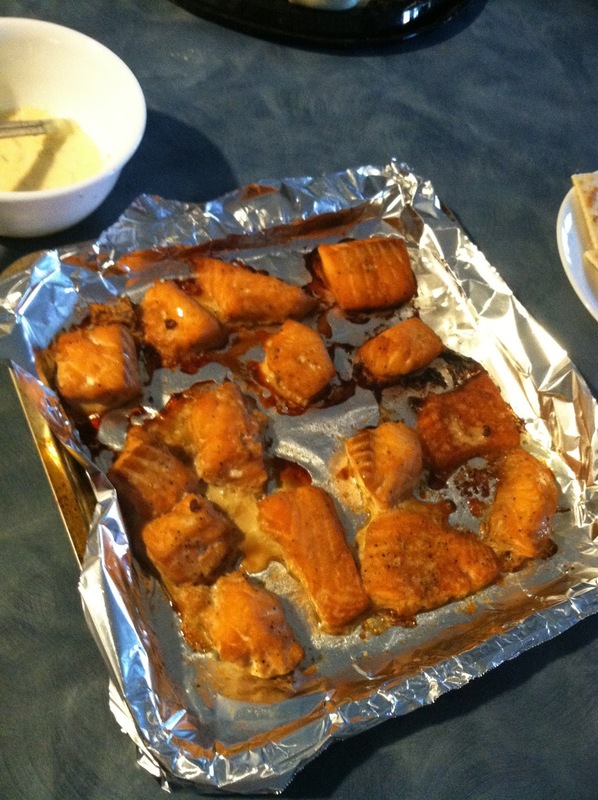 The salmon was nice and crispy - grilled really nicely. 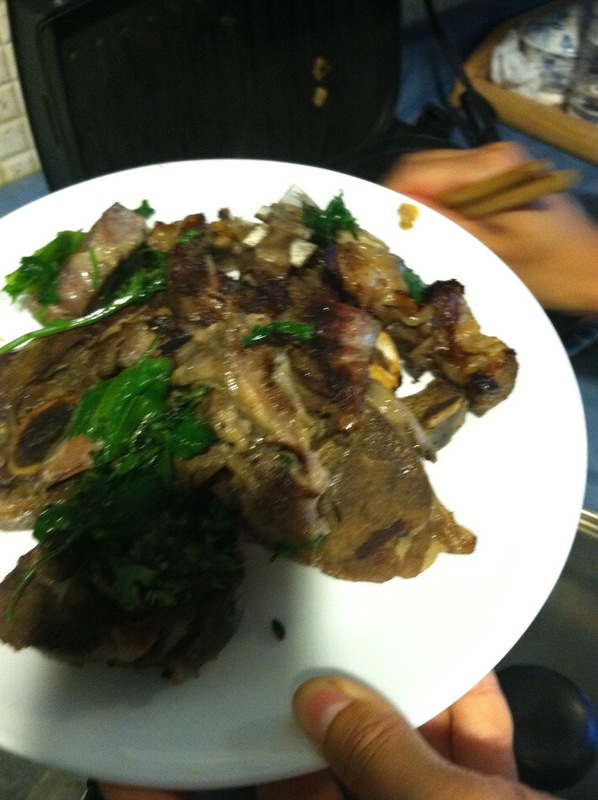 And we also grilled some of the lamb racks that we had on hand in the fridge. There is actually a technique to properly boil your dumplings so that the filling doesn't fall apart. 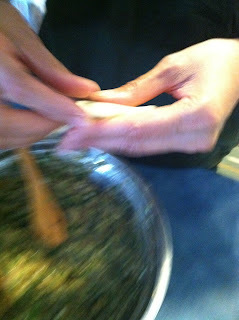 You have to gently stir the dumpling pot with a wooden spoon in a clockwise direction and then wait until it floats up to the top. 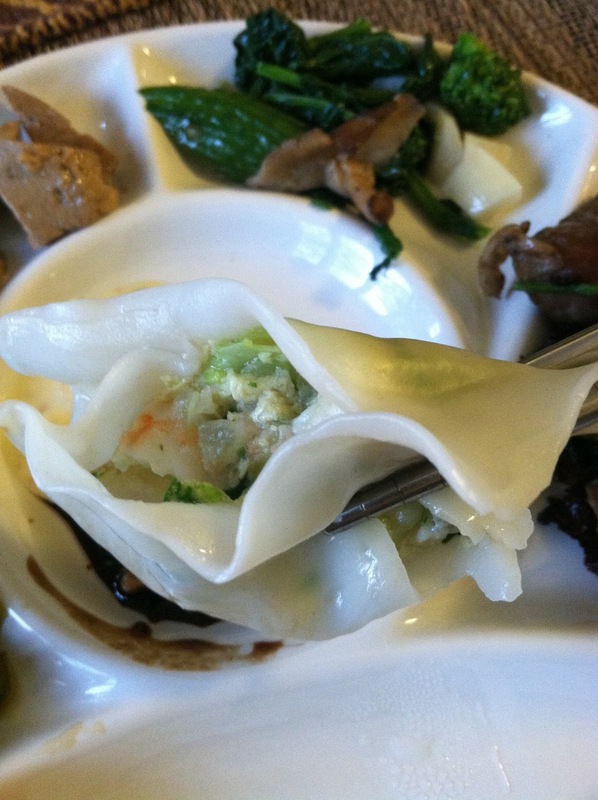 When the dumplings are almost ready, stir in the opposite direction. We cooked up about three plates of dumplings, enough to fill up the entire table. We really like using these dishes that resemble a bunch of Korean side dish plates combined together. 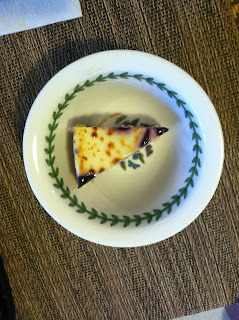 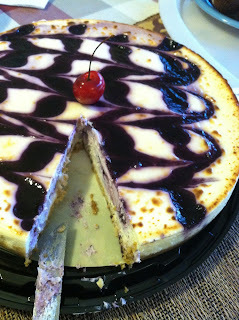 And at the end of that huge meal, we had some blueberry cheesecake (also curtesy of Costco).